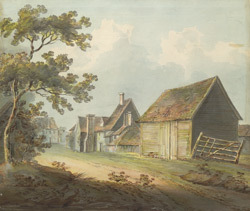 View of the town of Radlett in Hertfordshire. Radlett is situated on either side of the important Roman road of Watling Street, about 3 miles from Elstree. The origins of the town date from before the 18th century however it was during this period that the town developed due to easy rail and road transport links to London. Radlett lies in a valley, through which runs a stream which feeds the river Colne. It is thought that this rover give the town its name- the river served as a mill-stream and was named Leat or Lete. Soil in the area contains large quantities of clay and so the water would have appeared to be red (Rad) in colour. Hence Radlett can be taken to mean ‘Red Mill stream’.